The cyberwar in healthcare continues. Get the latest research on the top threats in the industry and see what you’re up against. Web filtering around HTTPS websites just got way more complicated. Download this guide to see how AccessEnforcer can help. New attacks are launched every day – with ransomware, DDoS, and phishing just starting the list. This report shows you the top five cyber threats to small businesses in 2017. You’ll see what to expect and how to protect the network. Get the lowdown on one of the hottest hacker trends of the year by downloading this comprehensive report on the do’s and don’ts of handeling email phishing attacks. The Internet of Things (IoT) is exploding. Download this free report to uncover how IoT devices threaten your network security. You’ll see how hackers are exploiting this fast-growing technology and how to stay safe. VPN services are an essential part of the modern small business. This report shows you how our VPN services make it easy for you to stay connected to networks across the street or across the globe. Prepare yourself for whats ahead in the world of cyber security by checking out our report on the latest hacker trends. See how to protect your business from threats like Cryptolocker and CryptoWall. You’ll also learn how these threats progress and how they are expected to evolve. Every IT provider should know HIPAA before serving clients in healthcare. But with so many rules, how can you know the right ones to follow? The HIPAA regulations are hundreds of pages long. We did the hard work for you and found the parts that apply to IT. Get a detailed view of the HIPAA requirements that AccessEnforcer helps check off your list. See how AccessEnforcer fits the latest payment card industry regulations, PCI DSS version 3.2. We list the exact requirements and how AccessEnforcer helps meet them. See how this MSP landed new clients after switching to a simple, affordable solution. See how this MSP was able to negate expensive licensing and increase profits with a single, simple solution. 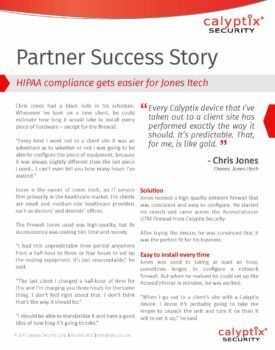 This health IT provider found a better way to protect clients’ networks, save time, and keep clients out trouble with HIPAA. After a firewall vendor pulled the rug from under this IT provider, the company began the search for a new vendor and found something more: a powerful solution from a reliable partner.